The sun produces an abundance of free, clean renewable energy. This energy can be harnessed to convert into electricity by installing solar photovoltaic panels also known as solar PV. The solar cells within these panels produce enough energy to provide you with your own electricity which will save you money on your electricity bills and provide a source of tax free income from the Feed-in tariff for 20 years. They are an ideal investment for your domestic property. Photovoltaic (PV) cells are made from layers of semi-conducting material, usually silicon. When light shines on the cell it creates an electric field across the layers. Groups of cells are mounted together in panels or modules that can be mounted on your roof. The power of a PV cell is measured in kilowatts peak (kWp). A typical domestic installation will be rated somewhere between 3.5kWp and 4kWp – but the exact specification will depend on a variety of factors, such as the size of the house, number of occupants and current/future electricity needs. There are numerous products on the market to choose from. We will help you select the very best panels for optimal performance and to suit each individual’s requirements in terms of energy needs, property size and budget. The main component of a solar PV installation is the inverter. Solar inverters convert the electricity from your solar panels (DC, or direct current) into power that can be used by the plugs in your house for your TV, computer and other wired products (AC, or alternating current). Solar panels cannot create AC power themselves, they need to be fitted with an inverter. Product leaders are the Sunny Boy inverters produced by SMA and Fronius. The typical warranty on these products is 5 years however this can be extended to 25 years. Solar PV panels are well worth considering if you have a mainly south-facing roof with little or no shade. The maximum power output from solar panels will be achieved for a south-facing roof with a tilt angle of between 30° and 45° with no shade. Although a south-facing roof would yield the best power output, a south-west or south-east-facing roof would also be beneficial. Solar Panels work on both sunny and overcast days. Most roofs are suitable for solar panels regardless of pitch, velux windows or chimneys. 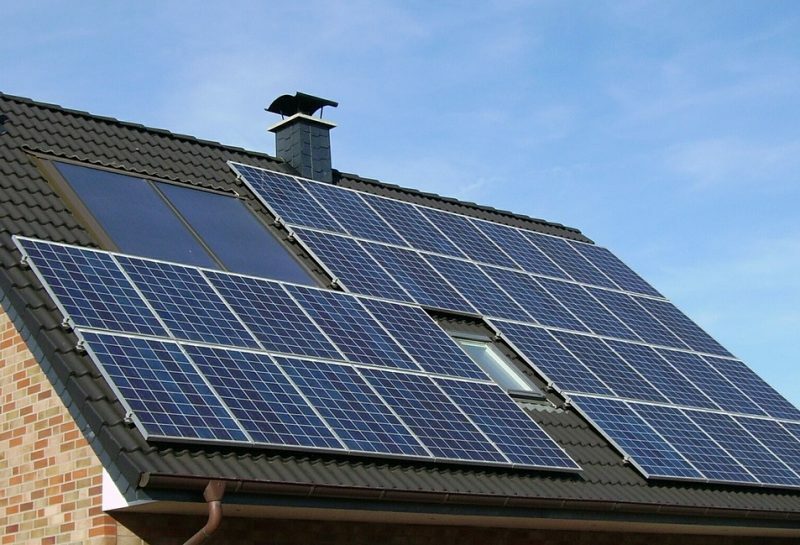 Planning permission is generally not required for domestic solar panels. Exceptions apply for listed buildings and buildings in conservation areas. The Met Office website has useful radiation maps. The higher the radiation figure, the more electricity your PV system will produce. Your energy supplier will pay you a further rate for each unit you export back to the electricity grid, so you can sell any electricity you generate but don’t use yourself. At some stage smart meters will be installed to measure what you export, but until then the energy you export is estimated as being 50 per cent (75 per cent for hydro) of the electricity you generate (only systems above 30kWp need to have an export meter fitted, and a domestic system is unlikely to be that big). Similarly, the export tariff is index-linked. These are reviewed every three months but fixed for you for 20 years from the time your system is commissioned. Rates rise with inflation. You will be making savings on your electricity bills because generating electricity to power your appliances means you don’t have to buy as much electricity from your energy supplier. The amount you save will vary depending how much of the electricity you use on site. When you invest in Solar PV for your home then there will be periods when you aren’t consuming all of the energy being generated by the array. This energy normally flows back to the grid seamlessly earning you an income. However, if your home has hot water storage with an immersion heater then Solar iBoost can be installed and start saving you more money on water heating bills instantly. Contact us today and we will arrange your free initial site inspection as soon as possible to assess your property’s suitability, and discuss all of the Solar PV options available to you. Fitting the Solar iBoost+ will not affect your feed in tariff payments in the UK. Where you have a “deemed” usage contract with your FIT provider you will be paid for the export value regardless of whether the energy is consumed or not. This is normally based on 50% of the generation reading and will not be affected. Solar iBoost+ enables you to usefully and automatically consume any excess energy generated rather than export it. Even with an export meter the benefits of the Solar iBoost+ can still easily outweigh rising energy costs. 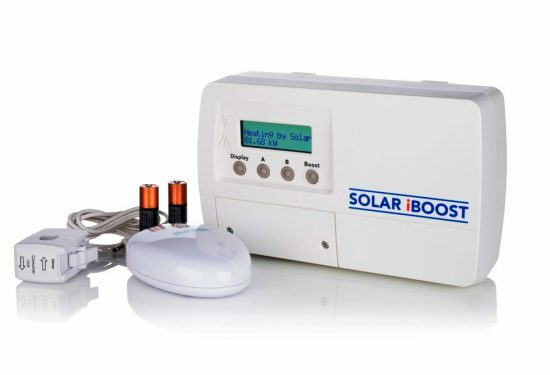 The Solar iBoost+ works in conjunction with the iBoost+ Buddy. The iBoost+ Buddy is a device which monitors your homes energy usage. The eco gauge lets you know when unused energy is available so you can switch on appliances. Keep the Buddy handy so you can check the intuitive “traffic light” energy indicator. Make the monitoring device work for you. Simply keep it handy and you will see when you are ‘Heating by Solar’ and ‘Tank Hot’. Whether or not we’ve installed your Solar PV system, they do require maintenance, albeit minimal. If the panels are kept relatively clean and are not overshadowed by larger trees or other unforeseen obstructions your panels will work at their optimum capacity. In the UK panels that are tilted at 15° or more have the additional benefit of being cleaned by rainfall to ensure optimal performance. Debris is more likely to accumulate if you have ground mounted panels. If dust, debris, snow or bird droppings are a problem they should be removed with warm water. However we would recommend that a system health check is carried out every 3 years as systems that are not inspected over this time period could be up to 30% less efficient than when they are new. Our Solar PV Maintenance packages will ensure that your system is safe and preforming to its full capability.